Driving down-country on the Norwich Road, I was reminded of the beauty of this part of Ontario which still retains a significant forest – very lovely and one could easily imagine a life here; but, then I had a vision of the parasitic wind reps who probably were on the same road, driving some generic white/black SUV with blacked-out windows. They are thick everywhere, and hadn’t I just heard that there were 30 of them bivouacked in the Forest Sands Hotel. The wind companies need a lot of these thugs. I soon arrived in Haggersville, the site of the ERT appeal into the Summerhaven Wind project owned by FPL – sorry, they don’t like the name of the corporate sire (Florida Power and Light) – so it’s NextEra. A name so much more contemporary and less “industrial”. TCI, the Irish company (I wonder if ever they will actually build a project), signed all the leaseholders to the original contracts, then sold them out to NextEra. Irish BS goes further than anything the dour reps of NextEra with their pinched faces could ever manage. The venue for the hearing is an older community centre, a smallish room with a parquet dance floor and simple, functional furniture. The mercury lights are right out of a hockey arena, casting a blue/green synthetic glow and humming so much that it was at times, difficult to hear. But we all made the best of it and a goodly number of locals were in attendance. I have some new friends now. 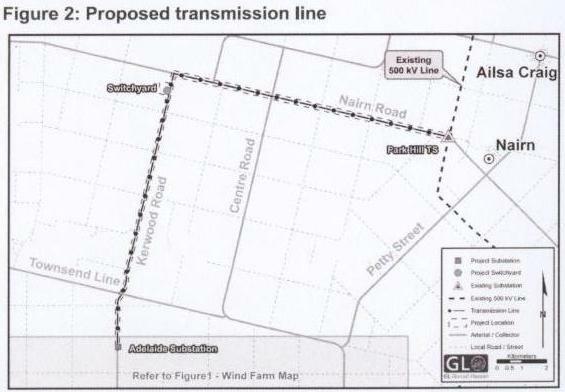 PLYMPTON-WYOMING – Suncor Energy’s plan to build a 100 MW wind farm in Lambton County has the potential to divide the community, a Plympton-Wyoming councillor warns. 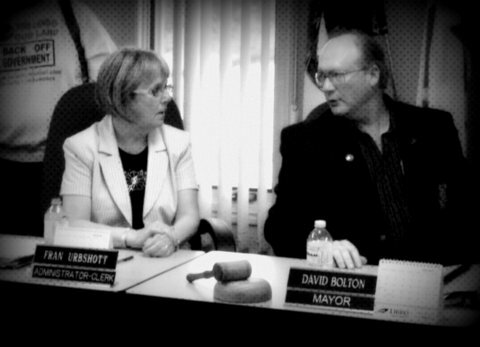 Opposition to the Cedar Point Wind Power Project is growing in the municipality, said Coun. Ron Schenk. “As the news gets out, more and more people are realizing what’s happening,” he said. Suncor has public meetings scheduled for April 18 at the Camlachie Community Centre, and April 19, at the Forest legion hall on Albert Street. Both meetings are 6 p.m. to 9 p.m.
“There will be officials there from Suncor to respond to questions and look at the various maps and displays with people,” said Suncor spokesperson Michael Southern. He said the company is just beginning the public consultation process required for provincial environmental approval of the project, which was awarded a 20-year Feed-in Tariff power purchase contract last July by the Ontario Power Authority. 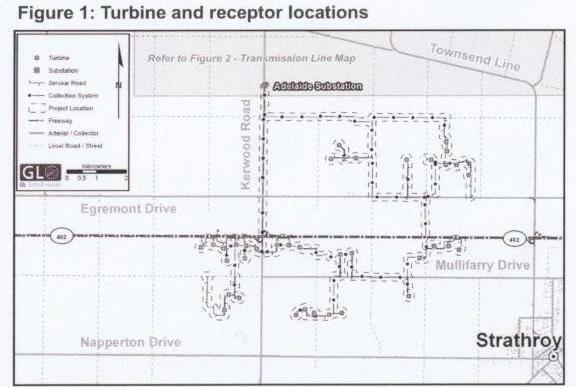 A draft project report Suncor has posted on its website says the Cedar Point Wind Power Project will have up to 62 wind turbines in an area stretching from O’Brien Road, north of Highway 402, in Plympton-Wyoming to just west of Thedford in Lambton-Shores. 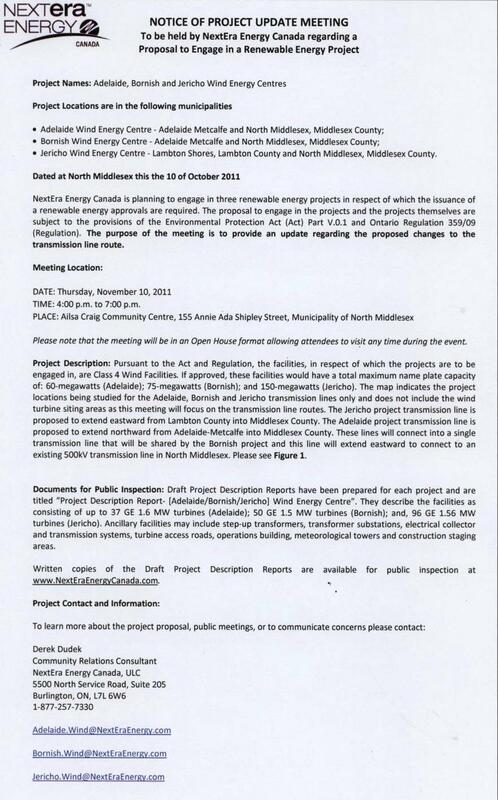 The report says construction could begin in June 2013, with the turbines operating by the following summer. Schenk said he’s not a fan of the project or Ontario’s Green Energy Act. 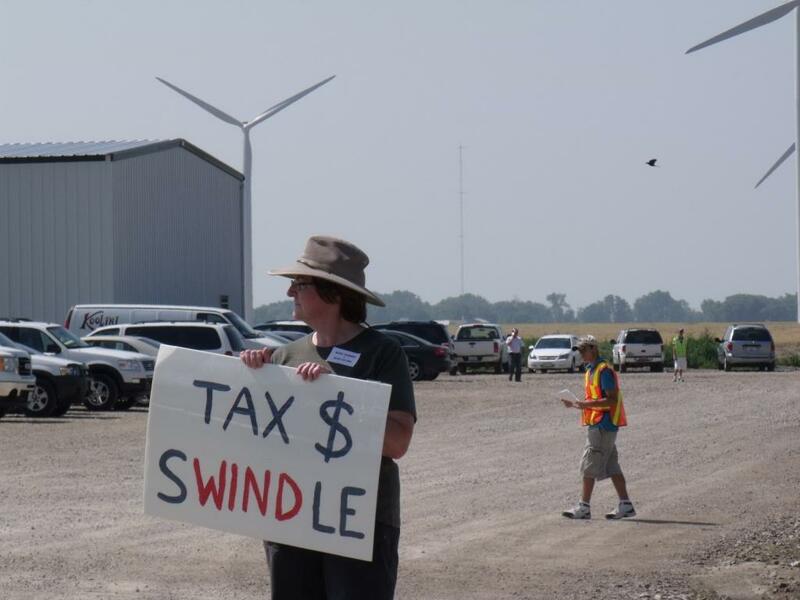 PLYMPTON-WYOMING – Plympton-Wyoming says industrial wind turbine operators will have to put down a $200,000 deposit for each of the massive energy makers before any soil is turned. It’s one of two new standards the township council passed recently in an effort to “protect our people,” according to Plympton-Wyoming Mayor Lonny Napper. After the province passed the Green Energy Act, municipalities had very little say in where or how many industrial wind turbines would be erected in the territory. 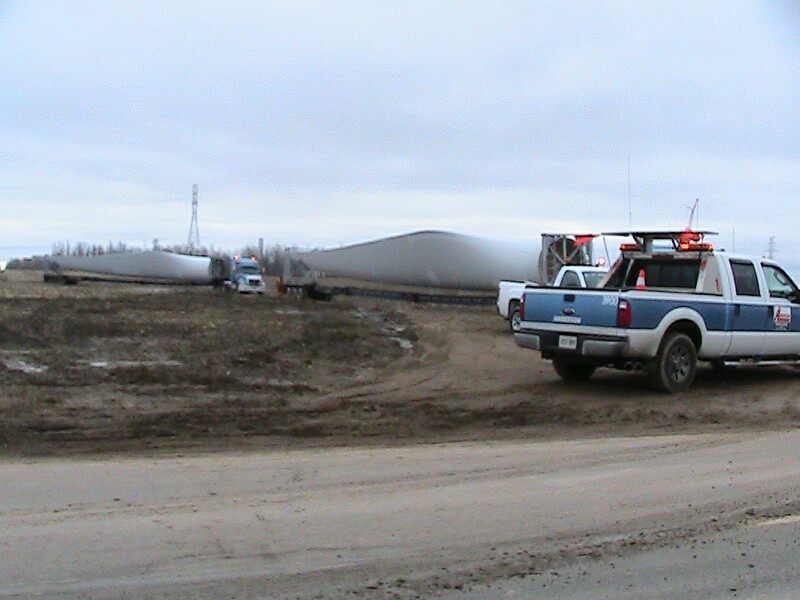 Suncor currently plans a 29 turbine project in Plympton-Wyoming, a move Napper is worried about. In January, council passed the bylaw calling for the $200,000 deposit reasoning there had to be money available so the turbines could be dismantled if, in 20 years, the original owners abandon the machinery. For Suncor, that would mean cutting a $5.8 million check to Plympton-Wyoming. Sewers brought to Kerwood (very good), but no water. What are the chances of that happening in the next 10 years? No surplus house severances, councillor MacKinnon was the only one who voted in favour of severances. This has become an ideological subject which defies logic. As the planner noted, there are 160 potential surplus houses which presumably are now rental units.It makes better sense to have them severed and make home-owners out of renters. 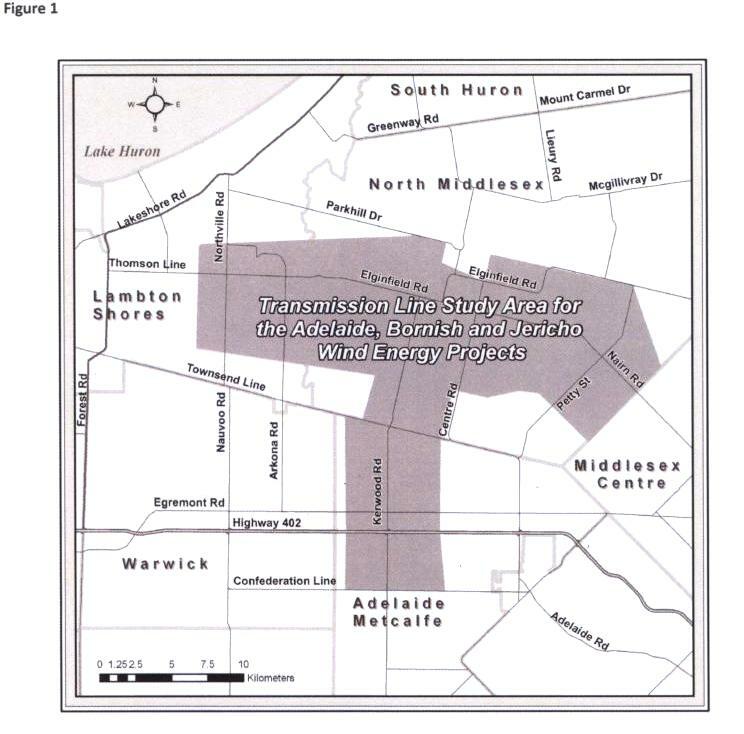 It would add ~ $200,000 to the tax base with no development costs. All candidates view the development of the Hwy 81 corridor as crucial to providing increased assessment. How that will happen is a mystery. As was pointed out by Putts Strybosch, the mayor is the salesman/ambassador for the township who answers the questions and makes the presentations to any commercial/industrial inquiries. He also noted that there is no office phone # for the mayor and no e-mail address, only a home phone #. This speaks of a backwoods way of doing business. The phone calls will go to Strathroy/Caradoc first. Thought we weren’t going to have one? Looks like we may get a last minute debate after all! Tell your family, friends and neighbours to come.